So I spent a bit of money getting, and a lot of time thinking and writing about, Luckyscent's Fueguia 1833 collection, and I decided that I was probably just going to stop ordering samples for a while, since most everything being made nowadays isn't (as arrogant as this sounds) up to my standards, when what appears in my inbox but an ad for another Luckyscent sample set, this time for Xerjoff's new Join the Club series? I was very tempted, as you can imagine. The idea behind the series is a clever one: ten fragrances reminiscent of various clubs — jazz, yacht, book. After reading a few of the descriptions, I clicked on the link to put a sample set in the cart, but before I committed myself I read more of the descriptions, and eventually it dawned on me: I have been seduced and disappointed before by collections, and not even that long ago, because this is exactly what happened with the Fueguia collection*, and the "Best of 2012" sample set (I would beg to differ: en masse, they weren't the best of any year), and presumably others before it. I love trying new things but even I have my limits. Fortunately, I still have lots of samples from various places, and so for the next little while, unless I weaken, I'll just be pawing through those. So reading the company's list of notes ("Bergamote & citron d'Italie, baie rose essence, ylang-ylang, sauge sclarée, iris de Toscane, vétiver de Haïti, benjoin, vanille..." — it always sounds so much better in French, doesn't it?) and Luckyscent's lip-smacking writeup ("another delicately hued composition that hovers just on the edge of being the most ethereal gourmand, with the subtle chocolate facets of iris, vetiver blending into the creaminess of vanilla and benzoin"), what would you expect: something thick and luscious, edibly tropical? Not a chance. 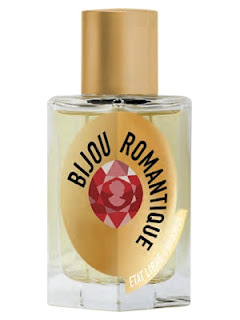 To my nose, anyway, Bijou Romantique smells like a whole lot of rather synthetic and slightly burnt spices. There's a bit of iris in there, but not enough to make me hate it, a smudge of benzoin to sweeten the deal, and a little clump of patchouli underneath it all, but otherwise it's nothing like advertised: it isn't a bijou, it isn't romantic, it certainly isn't feminine, and it's gourmand only if you like eating spices straight from the jar with a teaspoon. It took me a while to place it, but Bijou Romantique in fact smells like a reasonably precise copy of late-nineties Organza Indecence. *I hasten to say that I didn't hate all the Fueguias, and in fact one of them had such an impact on me that this morning as I was heading to the gym I realized with a shock that I could smell the wonderful Pulperia in the air until I realized that, doing construction work, some workers were welding cast iron while others were laying down pitch, the smell of hot iron and tar and the flurry of sparks creating the smell of Pulperia, and what a thrill that was. **If you watch that video of the speech, you almost feel sorry for him, because the second he starts in on the quote, he loses the thread of it — you can actually see it happen — and he realizes he's walked into a trap that there's no way out of, so he just blunders through to some kind of ending. But it's hard to feel really sorry for him: he doesn't appear to ever have had a coherent, independent thought in his entire life, and he was a stunningly bad public orator, a skill you'd think it would be impossible to get elected to office without. Every verbal trap he ever walked into he set for himself.